An artist statement is a short narrative that helps the viewer get inside your mind and understand the purpose of the work. In other words, it should be personal, interesting and make you sound like you take your work seriously. It can by about just one of your works, or all-encompassing like the one on this website about the work of Victoria Sambunaris. Be sure to read her statement carefully and see how her artist statement connects to her photographs. Finding out information on how to do photography assignments or even to look for ideas for topics and techniques is easy on the internet. I will post sights and resources for our various assignments here. Strip Composition: This project is a warm up for the next. If you pick the right images for this you will create a third image that shows how the principle of movement will keep the eye confused enough to try to sort out the two basic images from the third. Page 257-258 in the Photographic Eye. "Dan Inspired" Project: I've decided to rename this project to give you more freedom to create. This young man was a photographer and journalist who wanted to help change lives for the better. He and two other journalist were stoned to death at the age of 22. This project will help you express a cause you believe is worth fighting for as well as give you an opportunity to explore your own identity through the medium of collage. Motion Photography: In this unit, you will learn how to make stop action photographs as well as blurred images by controlling the shutter of your camera. If you have a camera with adjustable shutter and aperture, practice using it. If you have a simple point and shoot, you will learn how adding a flash---both indoors and outdoors, will stop the action and using low light indoor will allow you to blur the action. Notes on Chapter 10 pages 128-135 of The Photographic Eye will be turned in. Search for photos will go in your photo album. Stuart Allen is a local photographer who uses slow shutter speeds (if you have "B" on your shutter dial you can do this with your camera. Motion Blur can make very exciting images when you learn how to control it! Maya Lin and her Vietnam Memorial in DC Search memorials at the bottom of the webpage and go to the last choice, the Vietnam Memorial. Look at her other memorial projects as well. Articles that bring up important issues? What are the ethics, the rights and wrongs, of the art of photography? What are the different points of view to consider when looking at photos? Is photography truth? How do you tell? These are some of the questions I want you to be aware of. Digital Images : Altered or not? Photojournalism Ethics: "The Problem Seems To Be A Lot Deeper"
Many people get confused about laws regarding the use of photographic images in books, newspapers, collections, and most of all the web. You should be familiar with the laws, as well as your obligation to obtain model releases from people you photograph, and when they are minors, from their parents. Let's do a little research on the subject. 2. Model releases Look at the difference between a model release for an adult and for a minor. When are model releases necessary? This Nikon user forum brings up a number of issues and suggestions of interest. 4. Lawsuits that have been settled. Alberto Korda did not mind that thousands of artists and photographers used his image of Che Guevara without his permission. But he did draw the line when one advertiser stood to gain a lot in profit. Read about the case covered by CNN. 5. What can happen if somebody uses my photograph without my permission? You can earn up to 200 bonus points each 9 weeks. The last day to turn in bonus points is the last day before finals. For each 50 bonus points, you can earn a .5% grade raise. Points are calculated at the end of the 9 weeks and will be posted on the outside wall of the classroom. 200 points: We need boxes of disposable gloves, size large is preferable. This item is on my "MOST WANTED" list. -Visit a photo show at the Crocker or Viewpoint Gallery for 100 points. You must attach a flyer from the show and write a 100 word review. -Renaissance Waiver . Good job Renaissance students! -old towel torn into smaller pieces or 3 old hand towels. Photojournalism is story telling with pictures. It is a career path for those who are passionate about seeking and telling a personal point of view. It's a life of hard work, internal reward, adventure and continuous learning. Interpret the theme of "The Good, the Bad and the Ugly" to explore feelings about the world around you. That's stuff you deal with in your own neighborhood, on the block, the places around you, and the city you live in. 1. Check out this lesson on Photojournalism to prepare yourself. Takes notes in the Art Criticism section of your comp book. 2. Find 10 photos that inspire you and glue them into the Photo Album section. Write a paragraph that explains the story the photograph tells. Make sure it fits into the "G,B&U" theme. Write a second paragraph that tells what composition techniques, elements and principles , tips for taking better pictures are used to reinforce the message within the photograph. 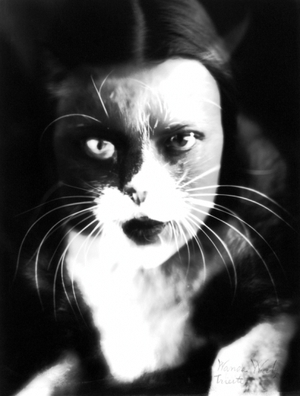 Although little is known of photographer Wanda Wultz (1925), her double exposure of Cat and I (translated differently sometimes) is in many of the history books. We will use this piece as a jumping off point to explore the idea of self identity. You will find an animal that personifies some of your inner qualities and combine your face with the animal in Photoshop. Be sure to start with a high res image, and consider how you will merge the two poses before selecting and photographing.. So you want to make up a critique? Critique days are usually on Friday. They are FUN! You will get to know the students in your class better, and they will get to know you, too. You will see all of the hard work that was accomplished in the last week. In the unfortunate event that you miss a critique, you can make up the points by using the guidelines for writing an "In Class Essay" in the School Reading and Writing Handbook (see post for Downloads for Students on this blog) on pages 22-26. 1. The critique must be turned in within 2 days of an excused absence to earn up to 9/10 points. 2. You can only turn in 3 per 9 weeks. 3. Your "in class essay" must be adapted to show a response to the following prompts only. You can use the resources available on Masters of Photography (http://www.masters-of-photography.com). Be sure to look at the photographs and to read the articles before writing the essay. * Ansel Adams' landscape photography is aclaimed around the world for its celebration of the American Wilderness. Write an essay in which you articulate the reasons leading to his fame and recognition. How is the work a synthesis of technological expertise and spirituality, as stated in the article? Do you think the work is noteworthy? Why or why not? *Jacques-Henri Lartique was a French painter who considered himself a snapshot photographer. His work was discovered by Richard Avedon, a leading fashion photographer. Avedon felt his photographs were one of the most important collections of photography in the 20th century. What distinguishing traits did Lartique's work have, and why was it considered so important? What differentiates his work from family snapshot photography? Do you agree or disagree that his work is significant? Why or why not? *Eduard Muybridge was an important 19th century California photographer who made a bet with Leland Stanford about how many feet were on the ground when a horse was running at a full gallop. To prove his point, he came up with a new photography technique. Explain Muybridge's important technological achievement and how it came to influence the California motion picture industry. Please be safe when you are photographing and working in the lab. We don't want anything to happen to you! It is better to be overly cautious rather than to overlook an unsafe condition. You never know when being cautious has prevented an accident but there is always a consequence if you have not; damage has been done or someone has been hurt. Therefore, it is good training to become aware of what you can do to prevent unsafe conditions that may result in accidents. It is easy to talk about safety, but it really hurts when your best friend is injured because of your carelessness or lack of attention to an unsafe condition. There is a fire extinguisher on the wall by the hallway to the darkroom. • When you hear a fire alarm, drop everything you are doing and leave the classroom in an orderly line. Walk together out to the fields behind the gymnasium. The teacher will meet you there to take roll. • Never touch electrical outlets with wet hands. • Do not allow any electrical devise to fall into or connect with water: electrocution could occur. • The teacher sets temperature dials for the presses. Know the correct settings and do not turn them up. There is a danger of fire occurring when paper gets too hot. • Wet floors are slippery and dangerous. Notify teacher when water has been spilled. There is a mop in the darkroom to wipe up spills. Evacuate the darkroom if water spills on the floor and turn on the lights until the water has been cleaned up and the floor is dry. • A violent reaction will occur if you add water to acid. Always add acid to water. • Wear gloves or tongs when working with chemicals. • Avoid splashing when pouring chemicals- use safety goggles and gloves when handling concentrated chemicals. • Do not eat or drink in the photo room. • Receive instruction on the proper use of a machine or tool before using it. • Keep the paper cutter blade down when not in use. • The mounting pressed and tacking irons are hot – be careful. Keep the tacking irons in the metal trays and do not let the iron touch the electrical cord. The dry mount press should not be set above 225°. • Do not lean on or trip over equipment or cords. • The light table is made of glass. Do not lean or place heavy materials like books on it. • When passing a scissors or Exacto knife to another person, pass it carefully with the point toward the floor. • It is easy to forget what you are doing when you are trying to make a good picture. Always be aware of your surroundings and where you are stepping. • Keep the strap around your neck or wrist. When passing a camera to someone else, make sure that they have a firm grip on it before you let go. • Never put a camera close to an edge where it can fall off. • Only 12 people can be in the darkroom at a time. • You cannot see very well under the safelights. Be extra careful when working in the darkroom. • Always walk in the photo room and darkroom. Running is dangerous. • There is no horseplay or fooling around allowed. It is childish and unproductive. • Report any accidents or injuries to the teacher immediately. • If a student is injured while you are out of the classroom, get help immediately. If necessary, go into the closest classroom available and ask the teacher there to call security. • Report any unsafe situations to the teacher immediately. • Report any student misbehavior that would jeopardize class privileges to the teacher. • All trash should be in the proper container after clean-up time. • Be responsible for cleaning up after you as well as helping get the classroom in order as well. • Take your photo paper, negatives, prints, portfolio, books, etc. with you when you leave the class. • Never risk your safety for a photograph! IT IS NOT WORTH IT! Be a safe driver. There is a link on the sidebar for you to study David Hockney's work. While he is most recognized for his paintings, he has said that it is his invention of the joiner print that is his most important contribution to art. My name is Nikki Pahl and I'm very fortunate to be able to teach some of the amazing students at Sheldon High School. One thing I tell my students, that people have told me is that "To photograph you must first learn to see." Many photographers will tell you this when you are learning to use a camera.